Catering to the customers' needs with excellence, we are engaged in offering high quality lot of Electrical Contact Cleaner Spray. Buyers can place bulk as well as urgent orders with us and we make sure to deliver the same on time. Cold cleaning of electrical contacts and equipment. Excellent solvency and deep penetrating properties enable liquid to penetrate beneath scale of oxides and grime. Jet spray action ensures reach into inaccessible areas. 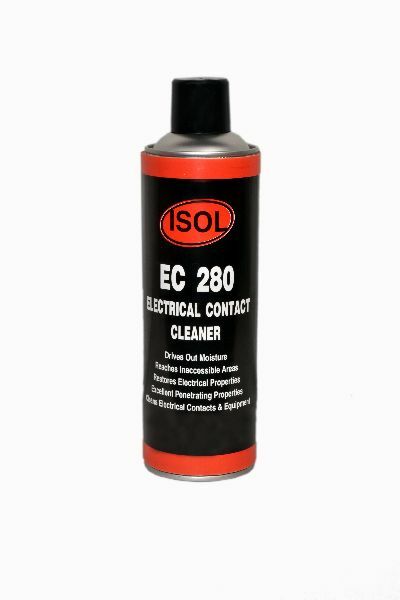 ISOL EC 280 is a non-flammable solvent composition propelled with a flammable propellant. it exhibits relatively rapid evaporation characteristics and does not attack metals, common plastics. However, certain delicate plastics may show signs of softening if prolonged contact is maintained. ISOL EC 281 is a fully non-flammable composition containing a non-flammable solvent and propellant. The non-flammability of ISOL EC 281 enables its use in non-ventilated area without risk of fire. Applications : Armatures Bushes, Bearings, Battery terminals, Bus Bars, Cable junctions, Connectors, Contacts of Switches, Circuit breakers, Coils, Conductors, Electric Motors, Spark plugs etc. Application Armatures Bushes, Bearings, Battery terminals, Bus Bars, Cable junctions, Connectors.